Okay, so i was in college, and my teacher challenged us to overcome ONE thing that we have to face the fear of something where we go up to the point where it becomes a daily routine. And when he told us this, i remembered my pokemon adventure thing on the forums http://leafre.net/showthread.php?8328-Pokemon-World-Adventure!%28on-hiatus-for-a-good-reason-3%29 And i decided to go back to drawing pokemon, and pokemon related things, because i want to continue the adventure. But i felt that before continuing the adventure, i should draw until i become really good at drawing or at least more "decent" because i wasn't that amused with the drawings on the adventure, so here on this thread i will update it with characters/pokemon that i am drawing to show the progress i am in with drawing. Please criticize me so i can become better and continue the adventure more epicly :D.
And yea, i drew that. 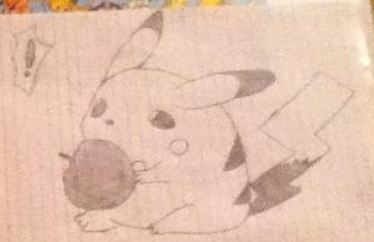 Looks like you just traced it from the pikachu book behind it. 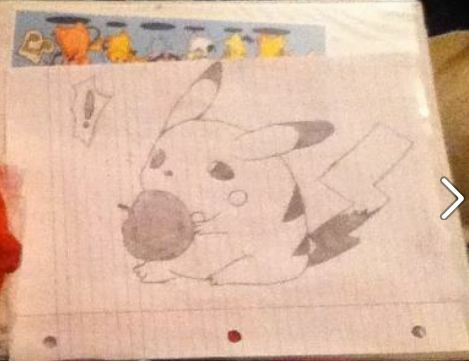 I drew the picture, and gave it to my friend, and that is her binder behind. I have an odd request, @Sora I have tried doing it before, and it usually comes out... well strange. Then again, my drawing ability is near 0. Anyhow, try drawing YOUR take on the angel of death. Yeah, I know it sortta has a religious aspect to it, but that's not really what I think of about it. I usually think of the eternal struggle within the human soul between good and evil, in this case the struggle between the good of the angel and the evil of death. My drawings and mental images usually portray half of it being angelic and the other half being demonic. Draw your take on it, I'd love to see it. i love the origian pokemon, i wan wondering could you do a charmander? :D i would be the happiest guy ever.